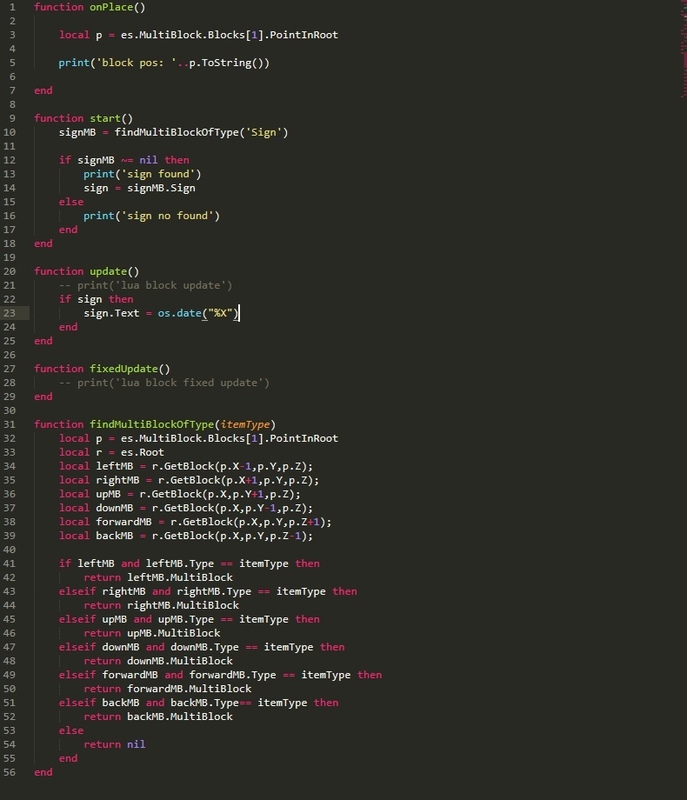 And now you want to know what you can write to a script.lua. 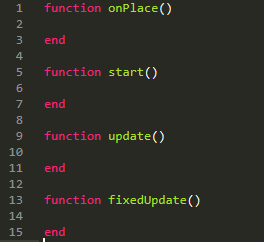 In your script you can define functions with these names and they will be called by Evertech Sandbox game at some events. onPlace will be called when the player placed your modded item. start will be called after initializing the object, it can be called after you placed an item or after the level loaded from a save file. Let’s write a hello world program. You see, it is very small… It just writes a “Hello world” string to a console. But wait, what is console? You can activate a console if you go to a pause menu in a game, then go to settings -> lua settings and click the “Show Console” button. Wait a little bit while it loads itself, then you can close it and since this moment it will log all messages from lua programs. Now if you created your hello world mod we can test it. Activate a console, then place your modded item somewhere. 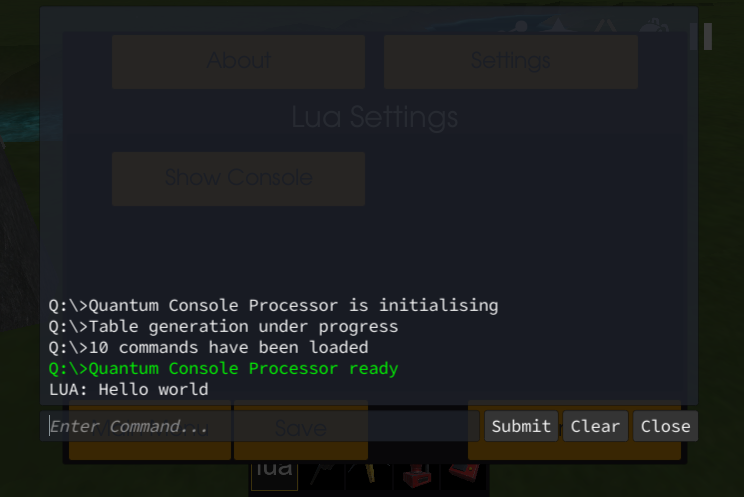 If you did everything right you should see “LUA: Hello world” in the console. 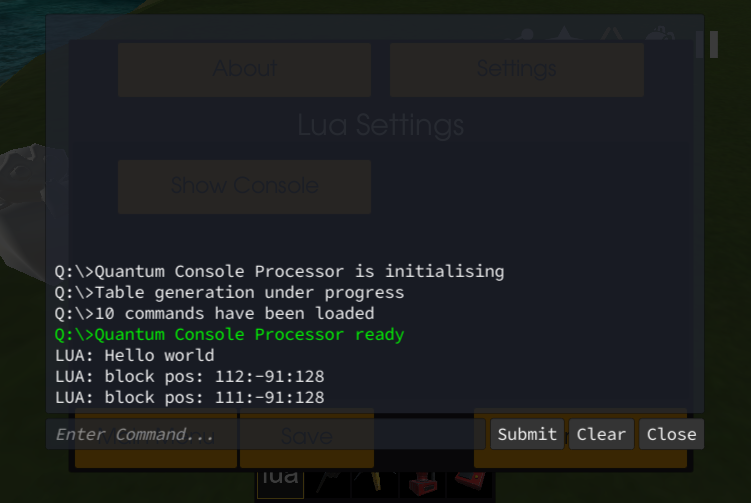 By the way you can also enable debug info in (Settings -> Common Settings -> Show Debug Info) and you will be able to see last 5 messages from lua while you are playing. 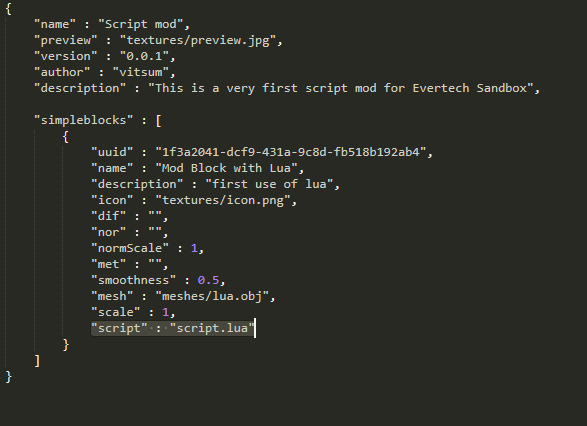 In order to do something useful we need to call Evertech Sandbox API methods. To access them we will use a “es” object. For example let’s create a modded item which will delete itself in 5 seconds after it was placed. 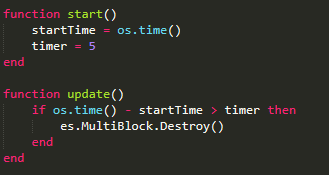 So we stored a time when the script was initialized, then we initialized a new variable named timer with a value 5. In the update function which is called every frame we check how many seconds have passed since initialization of our script. And if is more than 5 seconds we destroy are item. To destroy an item we used “es” object, got a MultiBlock object which represents current object, and called a method of it named Destroy(). Now if you test this mod, you can place an item and it will delete itself in 5 seconds. Root is a place where every item is stored. It is like a grid, and you can put a block in each cell. But we have Items which are bigger than 1x1x1 cube. And in order to unite the blocks of one Item we have a type MultiBlock. Here we created a local variable p to store a coordinates of a block of our mod. Simple blocks have only one block in it. 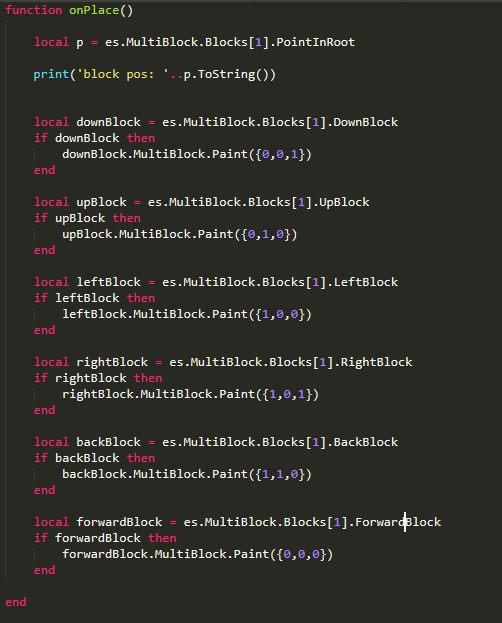 MultiBlock type contains an array of Blocks, arrays in lua are indexed starting with 1. To access the first element of an array we use square brackets and a number 1. The Block type contains a property PointInRoot which stores a coordinate of this block in the root. If you created a mod with this script you can test it out. Don’t forget to activate a console first by going to settings and pressing the button “Show Console”. After you placed couple of modded items you should see something like this in the console . Now let’s just look at one example and I will try to explain what is going on here. 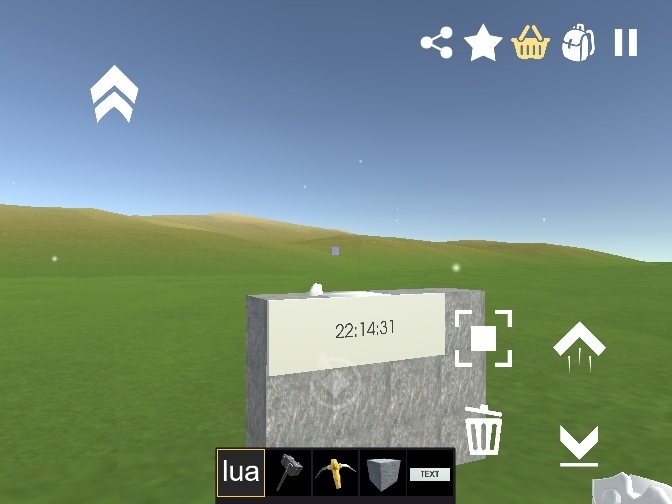 This mod works in such a way that when you place it it will check his 6 neighbors and if it finds an item of type Sign it will write a current time to it. In order for it to work you need to place a Sign, then remove some blocks behind it if there is no place for a new one, then place a mod block so it will find a sign. And if everything is right it will show the current time. You can ignore an onPlace function, it left here from previous example. Let’s look at start function. Here we call a function findMultiBlockOfType(itemType). It is the function which we defined ourselves, it checks neighbors at left,right,top,bottom,back and forward. If it finds the item of a needed type it will return the MultiBlock, otherwise it will return nil. The signMB variable will store a result of findMultiBlockOfType function, MB in it’s name is because it is of type MultiBlock, but you can name your variables hovewer you want. Then we check if signMB not equals nil, if it is not nil, then we found a Sign and we can continue to work with it. We print a message to a console ‘sign found’ then we store an object of type Sign to a variable sign. The MultiBlock type has a field Sign, it will return nil if it is not a Sign, but if it is a sign it will return an object of type Sign with help of which we can change the text and colors of a Sign. In the update function we check if the sign variable is not a nil and if it is not a nil then we put a result of a call os.date(“%X”) which returns a time in a format (“hh:mm:ss”). You can read about os.date here. And now let’s focus on the body of findMultiBlockOfType function and I will try you to explain how it works. In a local variable p we store the coordiates of a first block of our multiblock. (mod blocks have only one block in MultiBlock). Then we store a Root object in a variable called r just not to write es.Root every time. For each of 6 sides we call a function GetBlock(x,y,z) of a Root. This function will return a block or a nill if this cell is empty. Then for each of these 6 variables we check if they are not nil, and if they are not nil we compare their type with the type we passed as an argument. And if the types match we return a MultiBlock object of this block. If we don’t find the object of needed type (Signe) then we return nil. This mod will paint each of his neighbors to a different color, if there is a neighbor and if it is paintable. Block.DownBlock,Block.UpBlock etc, will return a neighbor block relative to a block orientation. MultiBlock – almost everything in evertech sandbox is a multiblock, it has info about the type of object and it contains array of Blocks which are stored in a root grid. MultiBlock.Type – returns a type of this item. It is a string. MultiBlock.Destroy() – this method will destroy this item. Block is a type which is stored in a root grid to reserve a place for a MultiBlock so two big multiblocks cannot be placed at one spot and will not intersect each other. Each block has a mass of 1 kg, the Root object will sum up all blocks and calculate it’s mass depending on blocks count. Block.MultiBlock – returns a multiblock to which this block belongs to. Block.Transform – is a transform of this block. Contains Position and direction vectors. Point is an object which stores a coordinates in root grid. Root is an object which is parent to all Multiblocks and blocks. There is a ground root and dynamic roots. Root.Rigidbody – returns a rigidbody if it is not a ground root. Rigidbody – With rigidbody you can apply forces or change velocity of the object. Rigidbody.IsKinematic – is a boolean property. False by default. If it is true then no forces are applied to this object and it will just freeze in space like if you used a tv remote on it. Rigidbody.Mass – ReadOnly. returns a mass of this root. The mass is calculated as a count of blocks in a root multiplied by 1. Rigidbody.WorldCenterOfMass – ReadOnly. is an array of 3 numbers. Returns a position of a center of mass of this object in world coordinates. Rigidbody.LocalCenterOfMass – ReadOnly. returns a position of a center of mass relative to a root transform. Rigidbody.Velocity – an array of 3 numbers. Returns a velocity vector. You can also set it by yourself. Rigidbody.UseGravity – is a boolean property. If it is false this object will behave as it is no gravity. Transform.Up – a vector of up direction relative to this object. Transform.Right – a vector of right direction relative to this object. Transform.Forward – a vector of forward direction relative to this object. Sign is a type to control a Sign Item. Sign.Text – is a string property. You can read or write a string from or to it. Sign.BackgroundColor – a color property. The Color of a background of a sign. Switch.IsOn – is a boolean property. You can read or write the value.